Today was to earliest start of the Nashville trip for the Global leaders. Our morning began at 6:15 am on Skanska’s HCA Tower Office project where we were informed that we must take part in something different from any site we had been on all week. Each morning ALL of the workers on site are required to gather together and participate in Skanska’s and Stretch and Flex program before any work is performed and if any worker fails to do so, they are unable to clock in for the day. 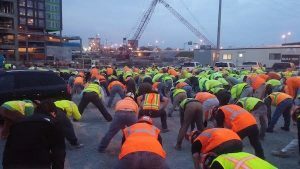 During the morning stretches music is played over the loud speaker and Skanska’s senior superintendent for the project takes place on the podium to lead the stretches and go over the overall daily job briefing and safety concerns that all workers should be aware of. This program was implemented to reduce stress and strain related injuries on the job site and in return, has contributed so much more. Workers appear much more alert in the early hours of the morning and moral is continually upbeat and positive. 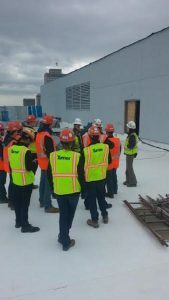 Once the general job briefing and safety concerns are discussed sub contractors divide into smaller groups to elaborate on more specific job briefings and safety hazards. We were fortunate enough to listen in on Baker Construction’s discussion (Baker is the concrete sub contractor for the HCA Towers). With a small gap of time till our meeting with Skanska’s management team we were able to pack up all of our belongings and check out from the hotel. When we returned back on site the senior project engineer, Stephanie Wigger, gave an introduction about who Skanska is and the values in which they stand for. 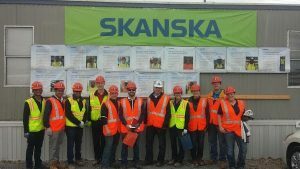 Skanska is not well known within Global Leaders so you can imagine we all had many questions about the company, culture and how they conducted business. 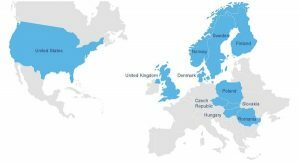 According to ENR’s 2014 records, Skanska is the 8th largest international contractor with offices dispersed throughout the United States and many countries across Europe. In the U.S. alone, their revenue last year was nearly $7.1BIL which ranked them at the 2nd largest contractor by revenue in the U.S. The culture of the company revolves around safety, ethics and diversity. This became apparent once we were able to walk around the site. Like many of the sites we had seen on this trip nearly all the floors were swept clean and material was neatly placed in organized piles on each floor. After climbing 16 stories worth of stairs, exhausted and out of breath we reached the hydro-tech roof (also known as a green roof). Striving for the HCA Tower to become LEED Silver certified not only was the roof of the building going to be green, many of the balconies consisted of a green system as well. Atypical of many other buildings in downtown Nashville, the upper floors were built with steel beams and a composite floor system rather than the locally common post-tension concrete. 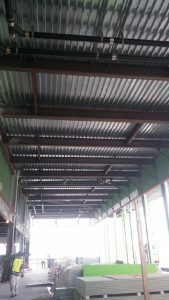 Given the mass amount of construction currently being conducted in Nashville, few concrete contractors were able to bid the job, thus the owner, HCA, decided to go with the composite floor system instead. This $140MIL project is projected to be completed early October of this year. While there is still much work to be done, assistant superintendent, Bryan Adams is confident Skanska will finish on time and on budget. 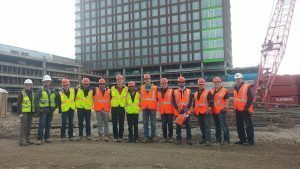 From all of the Global Leaders, we would like to thank Stephanie, Bryan and Skanska for taking the time to help us become better future construction managers.